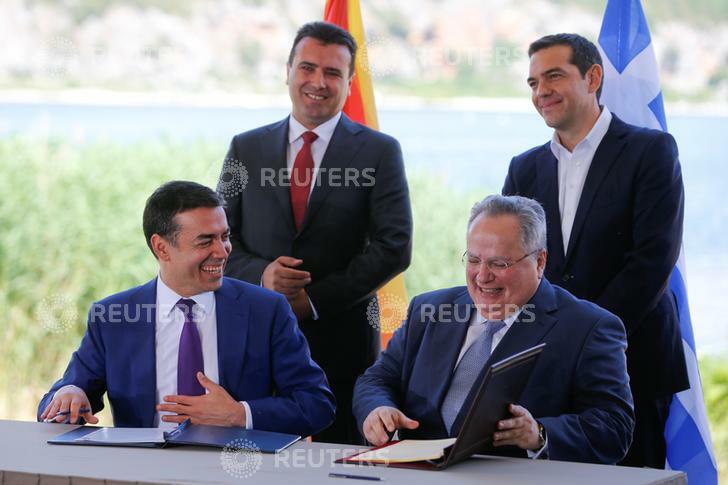 Greece, Macedonia sign pact to change ex-Yugoslav republic’s name – Royal Times of Nigeria. Greece and Macedonia defied protests and set aside decades of dispute today as they agreed on a new name for the Balkan state, potentially paving the way for Skopje’s admission to the EU and NATO. The foreign ministers of Greece and Macedonia signed an accord to rename the former Yugoslav republic the “Republic of North Macedonia,” despite a storm of protest over a deal seen as a national sellout by some on both sides. In the idyllic setting of Prespes, a lake region which borders Greece, Macedonia and Albania, officials from the two countries embraced, shook hands and penned a deal in the presence of European and United Nations officials. The agreement still requires the approval of both parliaments and a referendum in Macedonia as analysts say approval is far from assured, as it faces stiff opposition from the Greek public, and Macedonia’s president who has vowed to block the deal.